Learn more about different charging options for electric vehicles (EVs). 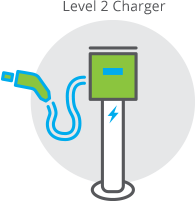 EV chargers are classified into three categories: Level 1, Level 2 and direct current (DC) fast charging. One distinction between these three levels is the input voltage, Level 1 uses 110/120 volts, Level 2 uses 208/240 volts and DC fast chargers use between 200 and 600 volts. Numerous manufacturers produce chargers, with a variety of products and varying prices, applications and functionality. Level 1 charging is cost-efficient – it uses a standard 110-V outlet, enabling EV drivers to use the charging cord set provided with most electric vehicles almost anywhere. This charging takes the longest and is used primarily as an additional, emergency or backup charging solution. Level 1 charging can be a viable solution in multi-unit dwellings (MUDs), like apartment complexes or condominiums, and some workplaces. In MUD settings, most Level 1 charging is conducted from existing 110-V outlets in the parking lot or personal garages/carports of residents. When new charging installations are planned, a higher output 240-V circuit is often more cost-effective as it offers greater charging capacity for an equivalent installed price. Level 1 charging power output varies slightly, but is typically between 12 amps and 16 amps of continuous power. At these levels of output, a Level 1 charger is estimated to deliver between 3.5 and 6.5 miles of range per hour of charging. These charging rates can be satisfactory for drivers who do not drive more than 30-40 miles daily and who can use the charger overnight. Most electric vehicles come with a manufacturer branded Level 1 cord set in the trunk. There are only a few third-party manufacturers of Level 1 chargers and most are designed for residential use. Level 2 chargers are typical solutions for residential and commercial/workplace settings. Most offer higher power output than Level 1 chargers and have additional functionality that is not available with Level 1 chargers. 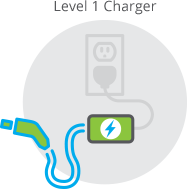 In general, Level 2 chargers are distinguished between non-networked chargers and networked chargers. Non-networked Level 2 chargers are used both in single-family residences and MUDs. They may be designed for indoor or outdoor use (e.g., NEMA 3R, NEMA 6P, NEMA 4x rated) and typically produce between 16 and 40 amps of power output, which can deliver between 14 and 35 miles of electric range per hour of charging. These serve a similar function as Level 1 chargers, however, if an electrical permit is going to be pulled to install a dedicated circuit for EV charging, it is most often a better value to have a 240-volt circuit installed for Level 2 charging. Non-networked Level 2 chargers are useful for installations at MUDs or commercial sites that are powered by the residents’ or tenants’ subpanels. In this case, any electricity used by the chargers will be charged to the individual’s electricity bill, thus eliminating the need to separately meter the chargers. Further, when electrical capacity is available, non-networked Level 2 chargers are useful for site hosts that need higher power than Level 1 charging but do not have a large budget. Level 2 chargers are available with a variety of power outputs from 16-40 amps, with non-networked chargers at a slightly lower cost than networked chargers. Therefore, if the resident/property owner doesn’t need networked chargers functionality (described in next section), non-networked chargers will suffice. While networked chargers are sometimes used in single-family residences, they are more common in commercial/workplace settings where payments are required or at MUDs where the property’s electricity bill is shared by multiple residents. They may be designed for indoor or outdoor use (e.g., NEMA 3R, NEMA 6P, NEMA 4x rated). Networked Level 2 chargers, like non-networked chargers, typically produce between 16 and 40 amps of power output, which can deliver between 14 and 35 miles of electric range per hour of charging, and their power output is sometimes adjustable. Some of the enhanced features include remote access/control via Wi-Fi or cellular connection, access control/ability to accept multiple forms of payment, load balancing across multiple chargers and more. Networked chargers are useful for sites that need to monitor electricity usage across multiple chargers, have multiple drivers sharing a single charger or require payment for use of chargers as well as for sites that have little electrical capacity and therefore need to balance their load. Some models of networked chargers also can limit charging to certain hours, which allows the operator to maximize a time-of-use (TOU) electricity rate structure and only allow charging when electricity is the cheapest (usually sometime between 9 p.m. and 6 a.m.). This type of control also increases the likelihood of participating in utility demand response programs. Therefore, while networked chargers are more expensive than non-networked chargers, they have much more functionality and can provide more options for a workplace, commercial site or MUD. DC fast chargers are the highest-powered EV chargers on the market. They often are used as range extenders along major travel corridors for long-distance trips and in urban environments to support drivers without home charging or very high mileage drivers. Most DC fast chargers on the market charge at rates of 25-50 kW. At current charging speeds, they are ideal for places where a person would spend 30 minutes to an hour, such as restaurants, recreational areas and shopping centers. Currently available DC fast chargers require inputs of 480+ volts and 100+ amps (50-60 kW) and can produce a full charge for an EV with a 100-mile range battery in slightly more than 30 minutes (178 miles of electric drive per hour of charging). However, new generations of DC fast chargers are gaining traction and can produce 150-350 kW of power. It is important to note that not every EV model is capable of DC fast charging, and therefore, they cannot be utilized by every EV driver. In addition, installations require a commercial electrician from the initial planning phase due to the electrical load and wiring requirements. Further, DC fast chargers have multiple standards for connectors, whereas there is only one common standard for Level 1 and 2 charging (SAE J1772). 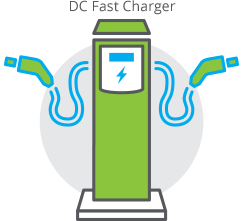 DC fast chargers have three types of connectors: CHAdeMO, CCS or Tesla.